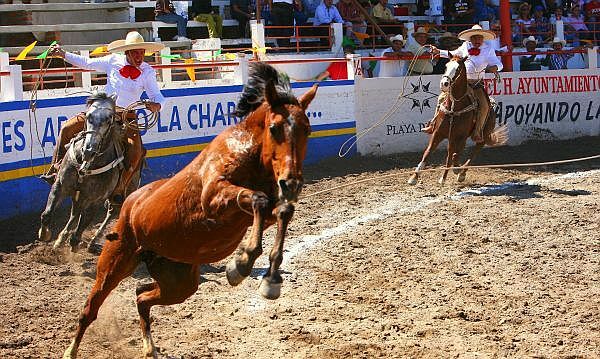 Home »Uncategorized»Puerto Vallarta Real Estate Tip: Charro Rodeo! Puerto Vallarta Real Estate Tip: Charro Rodeo! If you have never been to a real Mexican Rodeo, Vallarta offers two great chances to go. One is at the end of January (the government-sponsored version) and the old one. “The People’s Rodeo” is at the end of February and is sponsored by local businesses. Maybe it’s me, but I like the old school one, it’s not so fancy and has more charm. Event include equestrian style riding, trick riding, roping and the like. Just the pageantry alone is fabulous as the cowboys (or “Charros” as they are called here) really prepare for the event. The entire family is dressed “to the nines”, even the little ones. Women are now involved in the event as well, known as “Escaramuzas” they are fabulously dressed and amazing on the horses as well. A little known fact is that Elvis Presley’s first movie was called “Charro” and featured a song by the same name. Set in the west, Elvis is a cowboy and never sings in the film (that would all change soon!). If you are ever in town in February, the Charro events are fabulous and great for kids as well.